What is early shift and when does it start? HOWEVER: After three (3) consecutive days of EXTREME cease all activities. 6- yarding logs using cable systems. Can residents mow their lawn? Residents can use their lawnmowers for cutting their lawns. If the lawn is green and requires cutting, and has been irrigated, it is fire resistant. If residents want to mow their lawn when it is dry and dead, we recommend holding off or using preventative measures such as pre wet and post wet lawn; and remain on site after mowing to watch out for smoldering fires. Have fire suppression available (garden hose) and a way to contact 9-1-1 if need be. Can residents use a weed eater? Same principles as lawn mowing, but extra precautions should be discussed with the fire department is using metal disk blades. Can farmers hay their hay fields? However, during shut down there may be special fire prevention measures required. If not a critical job, we suggest holding off haying until the fire danger decreases. There are irrigated fields that are fairly safe to hay even in Extreme conditions. Is excavating a high-risk activity? As long as the excavation is being done on rock, dirt or mineral soil. Examples of excavating could be construction sites, septic tank, driveway work, etc… Excavating doesn’t include land clearing. Can residents use a chainsaw on a landing? Is drilling a high-risk activity? Contractors can drill in rock under no restrictions. Blasting is only permitted in early shift or regular shift. What is the Local Fire Hazard, what do they mean and how is it determined? Low: Fires may start easily and spread quickly but there will be minimal involvement of deeper fuel layers or larger fuels. Moderate: Forest fuels are drying and there is an increased risk of surface fires starting. Carry out any forest activities with caution. 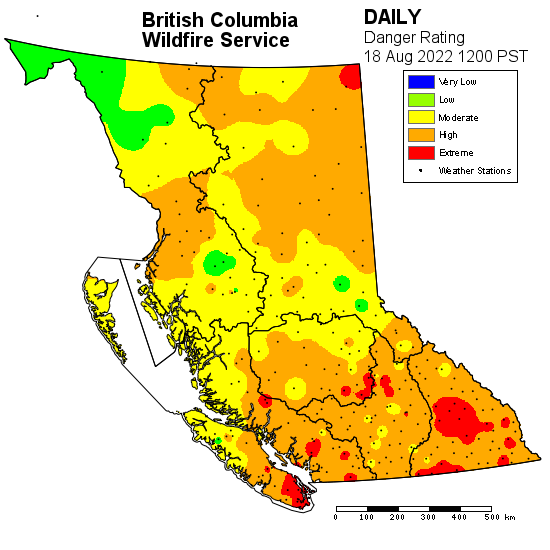 High: Forest fuels are very dry and the fire risk is serious. New fires may start easily, burn vigorously, and challenge fire suppression efforts. Extreme caution must be used in any forest activities. Open burning and industrial activities may be restricted. Extreme: Extremely dry forest fuels and the fire risk is very serious. New fires will start easily, spread rapidly, and challenge fire suppression efforts. General forest activities may be restricted, including open burning, industrial activities and campfires. Salt Spring Island Fire Rescue (SSIFR) posts the current Local Fire Hazard for the community on all three fire halls and at all three ferry terminals on Salt Spring Island. SSIFR also posts fire-hazard information on the website homepage, local media, Twitter and on Facebook. Who do I call to report a violation? Violations of SSIFPD Bylaw 125 can be liable upon conviction to penalties prescribed by the Offence Act. Under Bylaw 125, Open Burning caused by High-Risk Activities may be subject to Cost Recovery for expenses and resources incurred by the Fire Department to control or extinguish the fire. Additionally, the Wildfire Regulation and Wildfire Act are enforced by the FLNR Compliance and Enforcement Branch. The FLNR Compliance and Enforcement Branch and the RCMP may also actively pursue violators of these regulations when conditions warrant. Please refer to the Penalties and Offences section of the Wildfire Regulation, which describes penalties up to $100,000 and or one year in prison for violations. Note that a person responsible for starting a fire may also be charged for all fire suppression costs to the province. Further information on wildfires, provincial danger ratings and forest restrictions can be obtained by calling the toll-free Wildfire Information number: 1-888-3-FOREST (1-888-336-7378). Questions about SSIFPD Bylaw 125 can be directed to Chief Arjuna George at 105 Lower Ganges Rd. (250) 537-2531. To report a wildfire in the SSIFR district, call 911.